Drink Water! - Ahoy Reader! 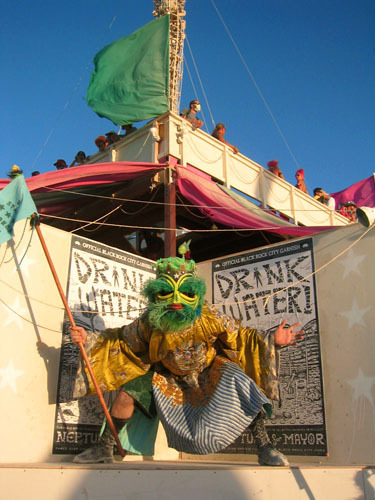 Neptune at the Man, Black Rock City 2005. Welcome to 2015! We are now two years into our tale and the action is just ramping up. The remainder of Chapters 5 and 6 will be filled with lots of big fire and explosions, so definitely stick around! The plan is to complete this story arch by the end of 2015, and print a collection in 2016. Here’s another photo from the archive, Neptune on the Man’s pavilion circa 2005! Keep those home fires burning, everybody, and thanks for stopping by!